The subject illustrates the conversion of the pagan Eustace to Christianity while riding with his hounds through the forest. Here he finds God in the form of a stag with a crucifix between its antlers. The print bears witness to Dürer's intense interest and skill in the depiction of nature. Giorgio Vasari particularly admired the various dogs in their different poses. 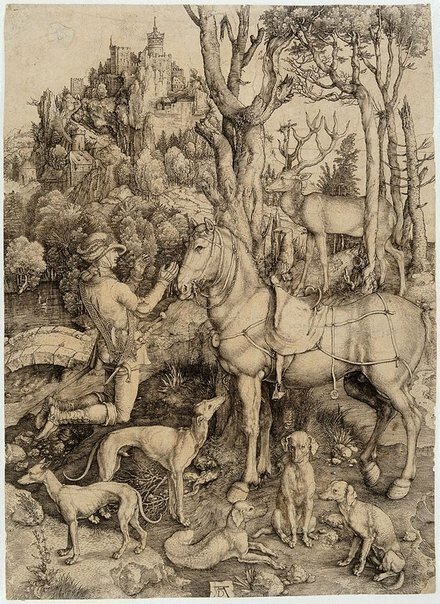 Dürer himself was evidently proud of this print and presented it as a gift on several occasions. Signed l.c., [incised plate] "AD [artist's monogram]". Not dated. Piety and Paganism , Sydney, 1991, 13.